Update: The Lightning Deal has ended and the price is now $25.99. This Amplified HDTV Antenna with a 50+ mile range and fantastic reviews is only $17.99 with this Lightning Deal at Amazon right now! It has a 50 to 80 mile long range, 13 ft coax cable and is a super price! I canceled high priced cable TV and love using an antenna instead. 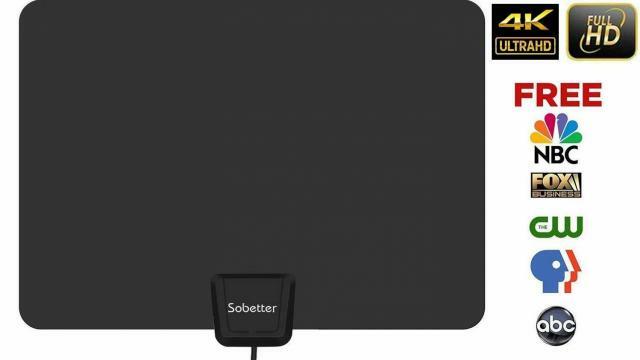 The TV Antenna is on sale for $17.99 at Amazon.com HERE! Shipping is free if you have Amazon Prime or on orders over $25. Get a 30-Day free trial of Prime at Amazon.com HERE. This is a Lightning Deal and will only be available for a limited time. Smart Spending Resources is a participant in the Amazon Services LLC Associates Program, an affiliate advertising program designed to provide a means for sites to earn advertising fees by advertising and linking to Amazon.com.